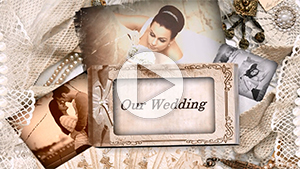 The "3D Wedding Album" template pack for SmartSHOW 3D presented in this video is a perfect base for creating your first family photo album - and we bet that it will amaze all of your friends. Professional photographers can use these templates to make a wedding photo slideshow for their clients. An album-style slideshow is never fading classics, but the "3D Wedding Album" templates are absolutely unique. This time, the designer decided to try something new instead of the usual page turning effect, and created an elegant 3D-book with folding and unfolding pages and adorable paper lace design. How to use these templates for your wedding photo slideshow? First of all, download the archive and install the "Calligraph Regular" font that comes with the templates and is used for captions. Then, install the templates and start your slideshow project. Choose the photos for each slide - the software will prompt you how many photos you need. Add transition effects between the slides (remember that gradient transitions work best for a wedding slideshow). Finally, add a meaningful soundtrack. Done! Your beautiful wedding album is ready, and you can burn it to DVD to give to all your relatives and wedding guests.